[Image: The former Polish National Alliance Building, now Studio Gang; via Studio Gang]. Just a quick reminder that, if you’re in Chicago this Friday, May 27th, Iker Gil, editor-in-chief of MAS Context, and I will be discussing A Burglar’s Guide to the City. We’ll be in the brand new event space inside Studio Gang’s newly renovated offices, the former Polish National Alliance Building on Division Street. The event is co-sponsored by the Seminary Co-Op bookstore, who will also be selling copies of the book. Issues of MAS Context will also be sale. Stop by to learn about super-tools of architectural breaking & entering, from lock picks to burning bars, about abstract geometric shapes visible only to lawyers enclosing domestic space against the threat of burglary, and about the most prolific bank-robbing crew of the 19th-century—led by a man who trained as an architect—among many other points of discussion. Things kick off at 6pm, at 1520 W. Division Street. Hope to see you there! [Image: Flying with the LAPD; photo by BLDGBLOG]. Monday, May 9th, AIA Center for Architecture, New York City—I’ll be speaking with fellow crime-enthusiast Tom Vanderbilt about various themes explored in the book, from lock picking and police helicopter flights over Los Angeles to security vulnerabilities hidden in a city’s fire code. Vanderbilt himself has a new book of his own out next week, called You May Also Like: Taste in an Age of Endless Choice, and he is also the author of Traffic and Survival City. Things kick off at 6pm. RSVP at the Center for Architecture. Books will be available for purchase courtesy of Brooklyn’s Greenlight Bookstore. Wednesday, May 18th, National Building Museum, Washington D.C.—Stop by the National Building Museum to watch clips from heist films, and to discuss the art of the getaway route, a typology of burglar’s tools, and much more. I’ll be introducing films, from Rififi to The Day They Robbed The Bank Of England, and speaking with Ross Andersen, senior editor of The Atlantic, for a full evening of crime and the city. Things begin at 6:30pm. Pick up a ticket from the National Building Museum website. Friday, May 27th, Studio Gang, Chicago—Iker Gil, editor-in-chief of MAS Context, will be moderating a lively conversation about A Burglar’s Guide to the City in the newly renovated office space of Jeanne Gang’s Chicago architecture firm, Studio Gang, winner of the 2016 Architect of the Year Award from The Architectural Review. Books will be for sale courtesy of the Seminary Co-op Bookstore. Stop by any (or all!) if you’re nearby, and be sure to say hello. [Image: Tunneling beneath Chicago; view larger!]. 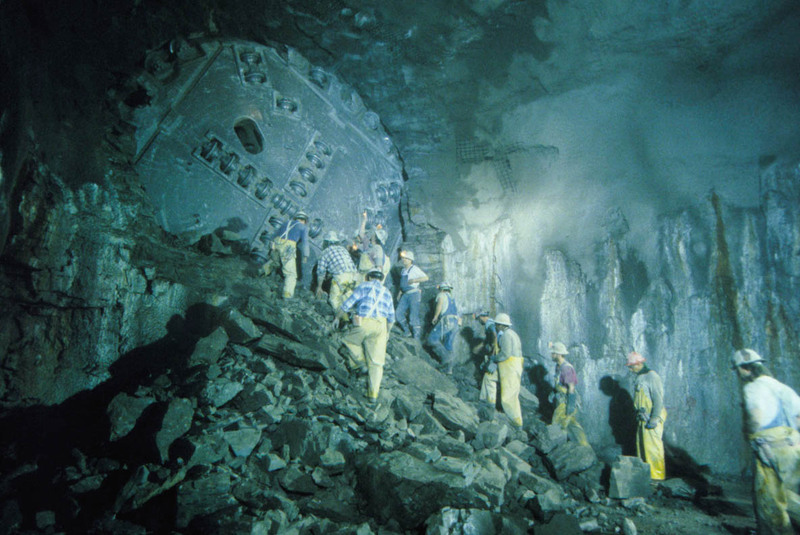 Due to Chicago’s ongoing TARP project—its Tunnel And Reservoir Plan—there are now “109.4 miles of tunnels bored beneath the Chicagoland area.” According to Tunnel Business Magazine, this massive network of new subterranean space includes “deep tunnels, drop shafts, near-surface connection and control structures and dewatering pump stations,” all embedded beneath the city. I would love to see Michael Cook sent there as a project photographer. Until then, the above image shows us TARP’s first phase in action, with a tunneling machine breaking through and expanding the artificial caverns that now resonate below the streets of greater Chicago. TARP’s second phase—the so-called Chicago Underflow Plan—kicked off back in 2008, its work “consisting of [the] mining and construction of several reservoirs,” vast hollows that will occasionally fill with storm runoff and rain, reknitting urban hydrology from below. (Thanks to Anya Domlesky for the link! Download back issues of Tunnel Business Magazine here).